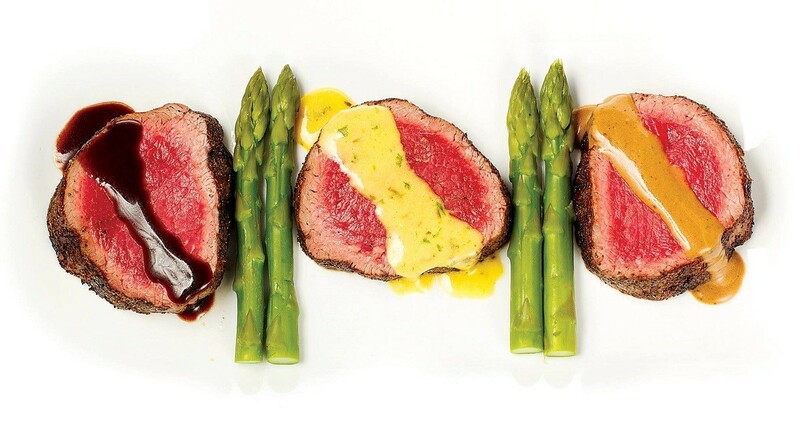 Perry's Chateaubriand served with three sauces - Béarnaise, Peppercorn and Truffle Merlot. Photo courtesy of Perry's Steakhouse. “Red with meat, white with fish” is a wine rule that many are familiar with, but rules are meant to be broken. Susi Zivanovic, bar director and corporate sommelier for all Perry’s Steakhouse & Grille locations wants patrons to think outside the box. That’s why she’s paired a sparkling wine with six popular courses for Perry’s “A Tribute to Champagne” event. We were invited to a media tasting of the pairing menu the other evening. Searching “pairing champagne with steak” on Google returns over half-a-million results from foodie websites and sommelier blogs discussing the topic. Many websites echo what Zivanovic said—that the acidity in champagne helps break down beef similar to the tannins in red wine. It makes sense—after all, it’s a shame to order a bottle of fruity Napa Cabernet Sauvignon only to start your meal with a crab cake appetizer that would be best suited with a crisp and citrusy white. 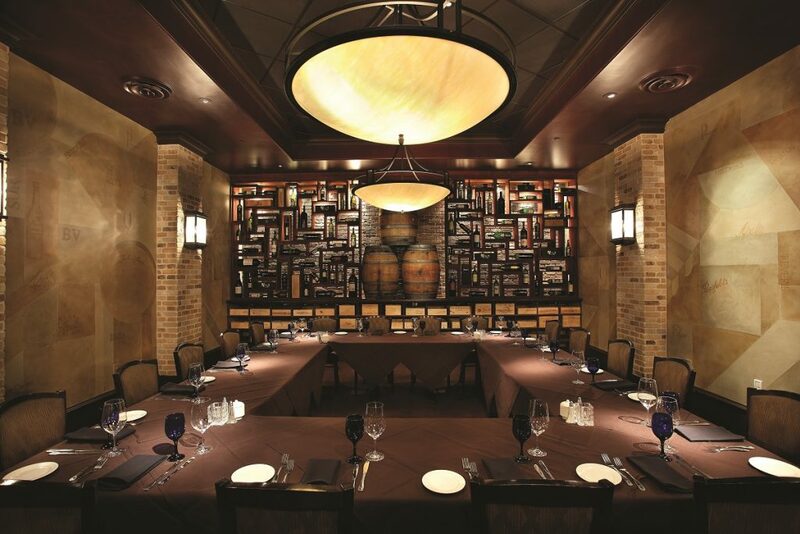 The pairing dinner will be held in The Cellar Room. Photo courtesy of Perry’s Steakhouse. Zivanovic purposefully picked wines at or below 12-percent ABV for a few reasons. First, the lower ABV is necessary when enjoying six glasses over one meal. Second, the wines act as a palate cleanser for the next course. Our first course was a new appetizer—bite sized pieces of Perry’s Famous Pork Chop, paired with a glass of Codorniu ‘Anna’ Rosé Cava dominated by the Pinot Noir grape. The sweetness of the Cava worked wonders against the caramelized crust of the pork chop, and there was a delightful hint of apple which played beautifully. Perry’s Jumbo Lump Crab Cakes. Photo courtesy of Perry’s Steakhouse. Our next course was Perry’s Crab Cakes paired with a glass of Bisol ‘Jeio’ Prosecco. The Glera grape predominantly used in Prosecco is incredibly aromatic, with notes of lemon and grapefruit filling the air. 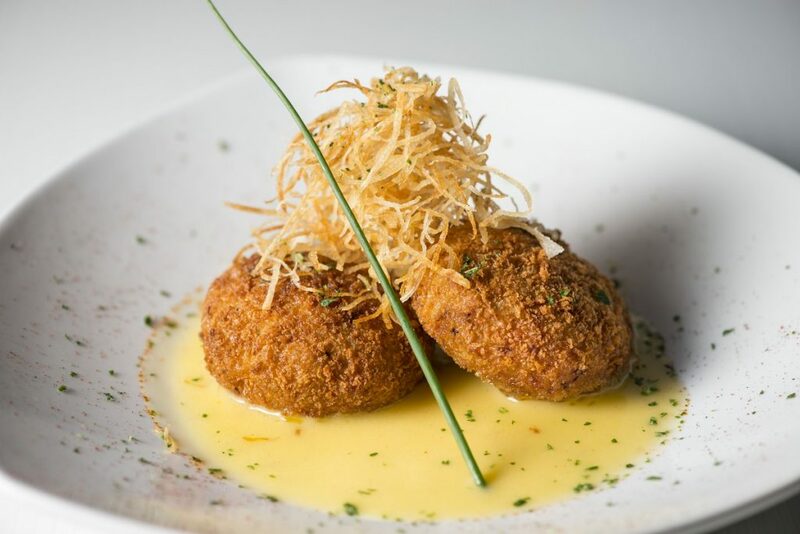 The citrus on the nose was also dominant on the palate, and though the crab cakes are definitely able to impress on their own, having prosecco alongside brought new excitement to the dish. The first red meat course was Perry’s new Steak Tartare comprised of finely chopped filet mignon with capers, shallots, Dijon mustard and a runny egg yolk. Simply put, this tartare is executed perfectly—one of the best in the city. The Cabernet Franc-based Chateau Langlois Brut Rose was served in a Cabernet wine glass which allowed the peppery aroma to shine. While sweeter than the red wines normally paired alongside would be, the Rose played beautifully with the sharp flavor of the Dijon in the tartare. Perry’s Chateaubriand (pictured above) was paired with the most recognizable Champagne of the evening—a 2006 Veuve Clicquot ‘La Grande Dame’; the wine which pays homage to the namesake Madame Clicquot. This Pinot Noir and Chardonnay grape medley is quite complex; notes of honey, coffee and toasted nuts complimented the roasted tenderloin and accompanying sauces. Perry’s Tuscan Style New York Strip. Photo courtesy of Perry’s Steakhouse. 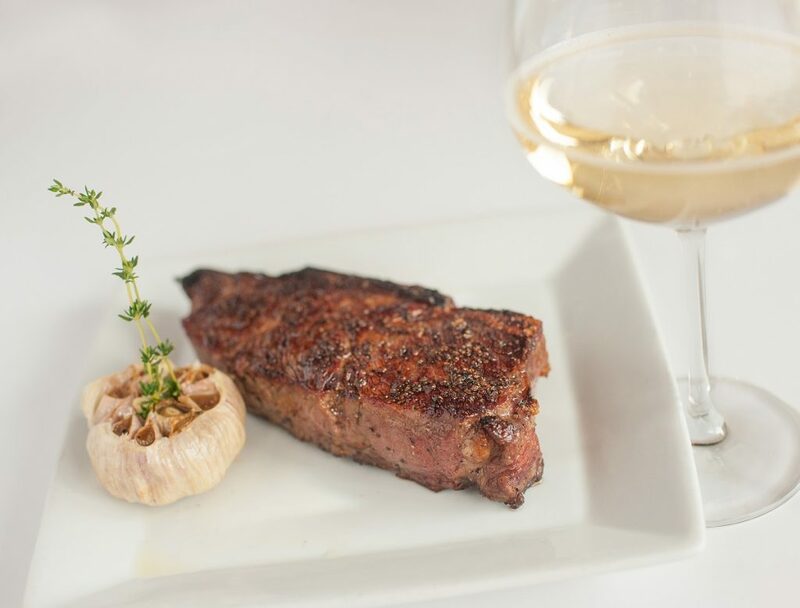 The Tuscan Style New York Strip was delivered with a glass of 2005 Bollinger ‘La Grande Annee’ Champagne. Zivanovic noted that this course was her inspiration for the Champagne pairing dinner. While having this meal with Perry’s chief marketing officer Lesa Sorrentino, both commented on how well the brandied fruits and spice notes from the Pinot grape complimented the steak. That’s when Zivanovic began creating her ideal pairings. Bollinger is the preferred champagne of James Bond, and it’s safe to say that diners will feel a bit like 007 while enjoying this course. Perry’s Chocolate Crunch is heavenly for dark chocolate lovers. Photo courtesy of Perry’s Steakhouse. 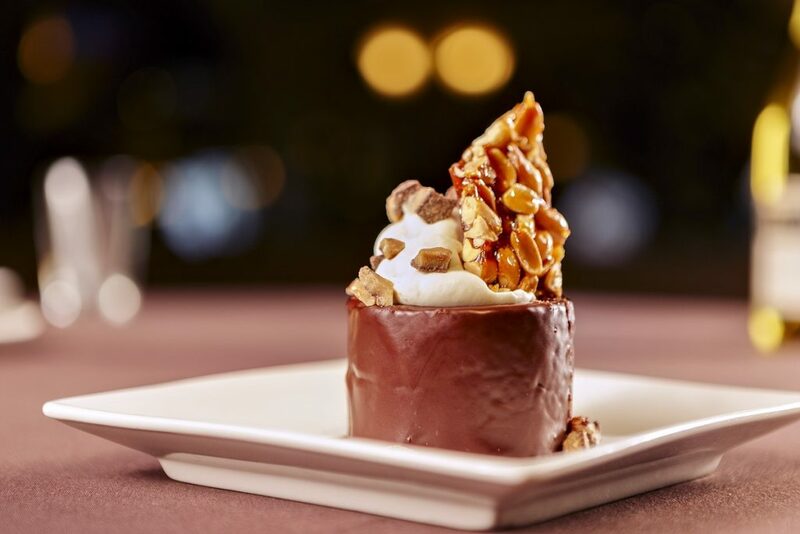 The final course was Perry’s Chocolate Crunch; a crunchy milk chocolate cake covered in dark chocolate ganache topped with whipped cream, toffee and peanut brittle. The 2015 Banfi ‘Rosa Regale’ Brachetto d’Aqui served alongside was sweet, but wasn’t overpowering. Flavors of strawberry and raspberry worked well with the chocolate and it was an excellent ending to the meal. After our six-course dinner, we were quite surprised how well each of the wines worked with the dishes. Others at the table seemed invigorated by experiencing something so out of the ordinary. While we don’t expect the “red with meat” philosophy to be replaced, we’ll be spending more time looking at the Bubbles section of the wine list. Perry’s Steakhouse is hosting their “Tribute to Champagne” event at the Memorial City location this Friday, July 21st. Seats are $150 and may be reserved by calling the restaurant at (832) 358-9000. Seating is limited to 25 and the event is expected to fill quickly, though Zivanovic is open to hosting a second seating to satisfy curious Houstonians.